Aficionados of great architecture know well the graceful, seemingly weightless domes and intricate mosaic tiles that are the signature of the classic Ottoman style. Striking an elegant balance between heaven and earth, light and shadow, these structures — mostly religious in purpose — transformed the landscape of Turkey beginning in the early 1400s. 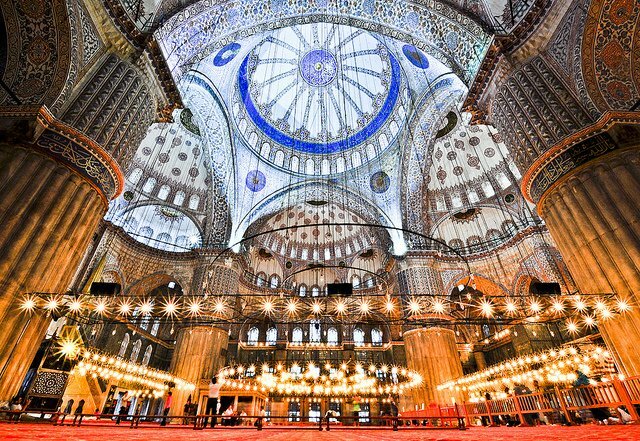 Recognized as the master architect of this period, Mimar Sinan blended the traditional Turkish style with the ornate elements of Byzantine architecture to create more than 300 buildings across the country. Turkey’s crowning glory, however, is not one of Sinan’s creations — it is the work of his student, Sedefkar Mehmed Aga, who strove to synthesize the teachings of his master while surpassing his achievements. 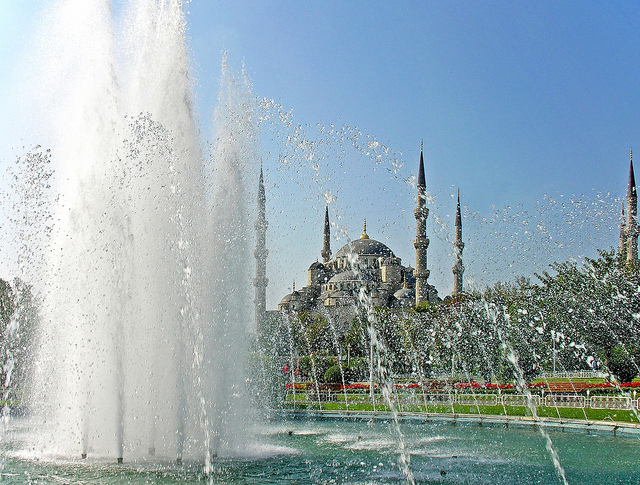 The result is Istanbul’s Sultanahmet Mosque, also known as the Blue Mosque. The Sultanahmet Mosque, located directly across from its inspiration, the historic Aya Sofya Mosque, is a spectacular collection of superlatives. From its large central dome, secondary domes and minarets spill out in a lavish display. The minarets and domes are finished in lead, with copper standards atop each minaret. The courtyard, nearly as large as the mosque itself, features a graceful vaulted entry with a centrally located fountain. Once inside, the view of the mosque is very nearly overwhelming. The huge interior is mostly open, with just four gigantic columns supporting the great central dome. The columns are highly decorated with 50 different tulip designs and a multitude of other floral elements. Decorative tile from Iznik, representing the absolute pinnacle of this city’s renowned workmanship, is prominent in the highest reaches of the dome. 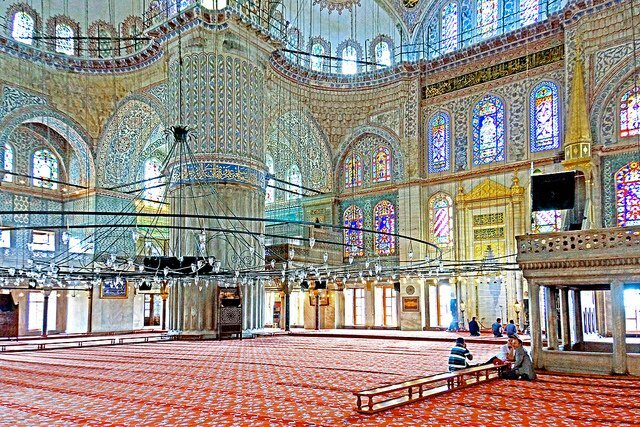 The signature blue and white colors of these tiles have given the Sultanahmet Mosque its better known name — the Blue Mosque. Additional tiles, only slightly less exquisite and made in Kutahya, bring the total number of decorative tiles to more than 20,000. The dome itself is decorated with verses from the Koran, displayed in elegant calligraphy. Interior space is softly lit by 260 windows, which at one time were furnished with the finest Venetian stained glass, but were gradually replaced with glass of a lesser value. Other decorative treasures within include masterfully carved wooden doors and window frames, and touches of fine mother of pearl inlay. Depending on which legend you prefer, the Blue Mosque was built by Sultan Ahmet I as an offering to Allah after forty years of military defeats, or in an attempt to build a monument in his name that would rival the great mosque of Aya Sofya. Either way, the Sultan’s legacy is a powerful work that defines the skyline of Istanbul today. There are also stories surrounding the Blue Mosque’s six minarets, which to all accounts were a complete scandal. The holiest of all mosques, Masjid al-Haram, the Grand Mosque in Mecca, had six minarets. Constructing a mosque with an equal number of minarets was taken as sacrilege, and an expression of great hubris on the Sultan’s part. To correct his error, Sultan Ahmet financed the construction of a seventh minaret for the Grand Mosque in Mecca. Sadly, the great Sultan did not live long enough to truly enjoy his magnificent mosque. He died of typhus at the age of 27, just one year after the mosque was complete. 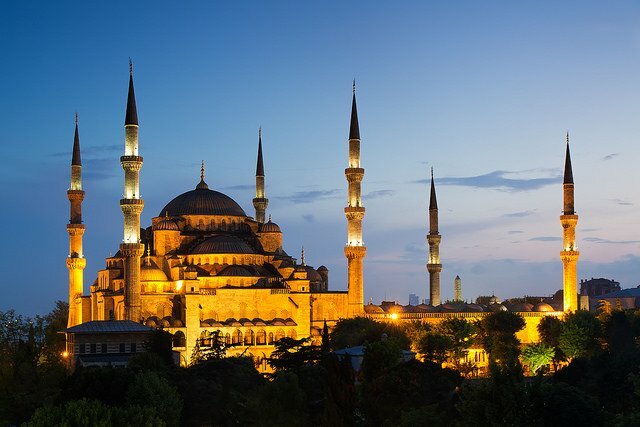 He is buried in a mausoleum adjacent to the walls of his great legacy — the awe-inspiring masterpiece of Islamic architecture known as the Blue Mosque.